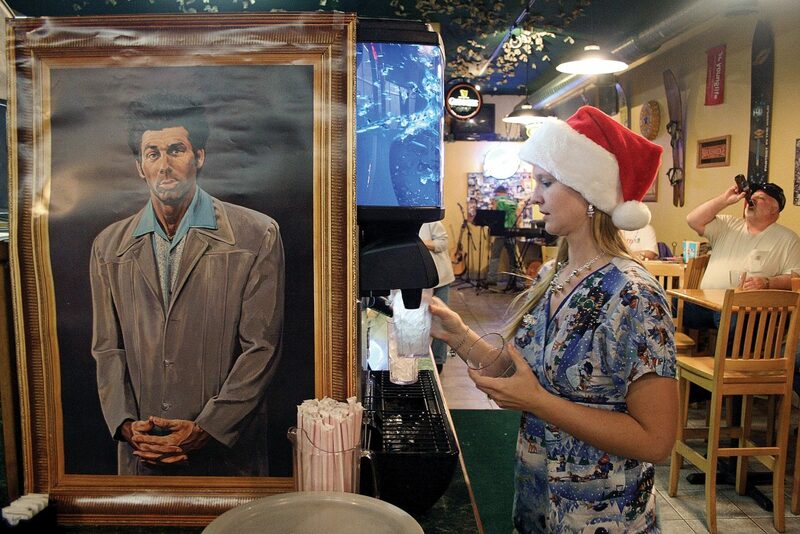 Lyndi Wagoner, a server at Carelli’s Pizzeria & Pasta, pours soda near a portrait of Cosmo Kramer. The restaurant hosted a Festivus party to a capacity crowd Thursday night. Jenny Jones, owner of Carelli’s Pizzeria & Pasta, stood near the front of her bustling dining area. The sounds of music and revelers nearly drowned out her voice as she spoke. Carelli’s hosted a Festivus party Thursday night to a capacity crowd. In keeping with the obscure holiday popularized by the television show “Seinfeld,” the event featured feats of strength, a Festivus pole and the traditional airing of grievances. However, if the partygoers were any indication, 2010 was a good year. Very few grievances were lodged. John Balzer stood at the end of a table and hoisted a large sub to his mouth. He said he had no complaints this year. Steamboat Springs resident Lisa Brown echoed that sentiment. “I have no grievances,” she said. Her boyfriend, Yuri Chicovsky, chimed in. “We’ve had a pretty damn good year,” he said. Over and over throughout the evening, Carelli’s customers expressed similar views on the year 2010. Craig resident Scott Smith said he just finished his semester at Colorado Northwest Community College. “I passed nursing school, so I’m happy for that,” he said. “Not too much bad happened this year. However, Scott’s twin brother, Sean Smith, aired a grievance. “Getting in trouble,” he said, succinctly. Asked what sort of trouble he’d been in, Sean laughed. “It’s off-the-record stuff,” he said. Craig resident Rowan DuBois said he disagreed with the airing of grievances. Carelli’s customers were invited to write grievances on sticky notes and post them on the Festivus pole, an otherwise unadorned galvanized pole, erected in the dining area. Craig resident Anna Herring posted a grievance to the Festvus pole on behalf of her mother. “It’s for my Mom. It says, ‘No more broken legs,’” Anna said. Anna’s mother, Laurie Herring, had a cast on her leg. “In the past five years, I’ve been on crutches three times,” Laurie said. “She’s very clumsy,” Anna said. Married couple Curtis and Debbie Cook were among the few who expressed serious grievances about 2010. “I want freedom to prevail and socialism to go away,” Debbie said. Festivus is known for its ritualized feats of strength. At Carelli’s, the feat of strength involved using a Shake Weight, the exercise device sold on television. Originally, the Carelli’s owners planned to judge Shake Weight users on “style.” However, Jones said the plan didn’t quite pan out. “Nobody’s really performed better than anyone else,” Jones said of contestants. Owner Jim Diehl said the event was a success. Jones confessed that she, like so many others, had no grievances for the year. “I’m very happy,” she said. “I feel very lucky. I have a great business. My daughter’s healthy.